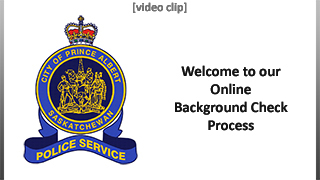 Welcome to the Prince Albert Police Service's new online process for persons needing a police screening check for volunteer or employment purposes. This system allows you to apply for a police screening check 24 hours a day without having to attend our facility. All aspects of the process - including verification of your identification, and fee payment - are handled electronically. If there are no concerns or follow-up required, your police screening documents will be mailed to you in a confidential envelope. Please note: You must be a resident of the City of Prince Albert in order to apply through this Police Service. Making a false statement - such as a non-resident declaring a local address at which they do not currently reside - will result in the discontinuation of application processing and the forfeiture of all monies paid. The Prince Albert Police Service recommends all Adoption applications to attend in person as they may require to submit their fingerprints off to Ottawa to complete a vulnerable sector search. The Prince Albert Police Service charges a basic fee of $35.00 for a standard criminal record check and an additional $35.00 for the vulnerable sector screening. The additional $35.00 is for a cost recovery of the equipment and staffing resources required to take and process civil fingerprints. Fingerprints can be taken at 45 15th St. W, Prince Albert from Monday to Friday, 10:00 am to 4:00 pm. Appointments are not required. A police record check is current as of the date it is completed. It is your employer/prospective employer or organization's function to determine if the record check is current enough to be accepted for the position applied for. The Prince Albert Police Services Board, its officers, agents and employees, shall have no responsibility or obligation to make such a determination. Incomplete applications (i.e. no identification provided, authentication aborted / failed / not completed or further information requested) and applications requiring in-person attendance will remain in the processing queue for no more than ninety (90) days from the time of initial application. Fees are non-refundable and incomplete applications will be considered 'abandoned', and removed from the processing queue after sixty (60) days. The Prince Albert Police Service will return the results of the check by mail to the applicant only. We will not mail the results to a third-party organization or employer under any circumstances.